This Little Piggy went to the market and the market appears to be in Bloor West. The owners of Thornhill’s Piggy recently opened a second location downtown offering a condensed menu of Korean favourites. When Meet-Up group Eat N’ Mingle organized a dinner to the restaurant, Rey made it sound so delicious I had to try it out. The actual cost for the meet-up was $35 per person; regular prices are included below for reference. Following traditions, a selection of banchan (side dishes) containing pickled vegetable and fermented kimchi arrives before the meal begins. Prior to the onslaught of meat and carbohydrates, I rather like the custom of eating vegetables first. After all, the salads help to negate the effects of pork belly, right? 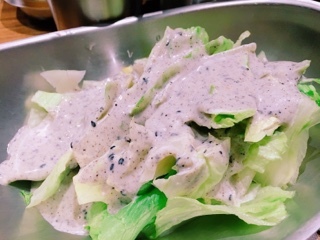 Aside from the flavourful sangchu geotjeori, a leafy salad dressed in a spicy vinaigrette, the restaurant also serves a mild iceburg topped with a creamy sesame dressing. 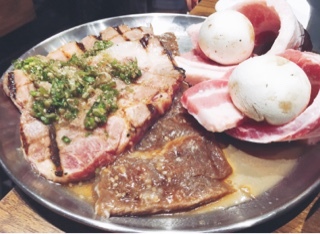 Their mixed BBQ combination ($41.95) contains pork belly, Korean-style beef and garlic pork. Personally, I prefer the meat marinated so you don’t need to rely on the garlic oil or bean paste condiments for flavour. Moreover, as the marinade’s sugars cook, they give off such a lovely aroma and leaves a lovely caramelized crust on the meat. Luckily, Little Piggy’s beef was well infused with flavour: the restaurant uses fruits in their house-made sauces instead of just sugar. On the pork there’s a thick garlic and green onion paste that you can certainly smell as the meat cooks. 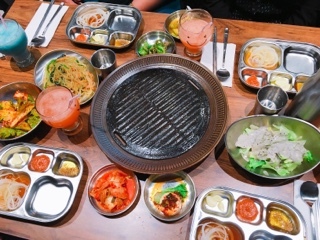 The restaurant uses a portable cooking plate, brought to the table only if Korean BBQ is ordered, helping to save space. However, the downfall of it not being built into the table is that while food cooks the juices and oil splash over the edge (sometimes giving you a sting on the arm). You’ll want to ensure drinks are nowhere near the cooking vessel unless you want an oily film on top. 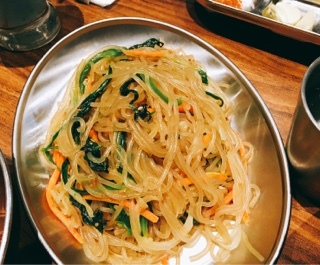 Japchae ($8.95): chewy glass noodles tossed in a sweet soy seasoning and slivered vegetables. The dish was decent and had we not inhaled it to start could have complimented the cooked meat nicely. Tteokbokki ($7.95 additional $2.95 for the fish cake): sticky rice cakes smothered in a sweet gochujang sauce with onions and fish cakes. The sauce was too sugary for my taste – even a neighbouring table described theirs as sweet Ragu sauce. To be fair, ours still had a hit of the fiery kick from the red chili paste, it was simply overpowered by the sweetness. 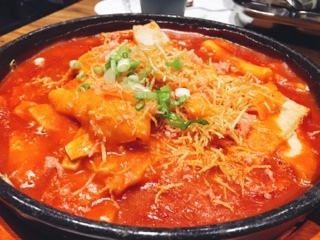 Additionally, we all agreed the tteokbokki needed more rice cakes – with a table of four we each only consumed about two rice cakes compared to the mountain of other ingredients on top. I’d go for the UFO fried rice ($12.95) instead. 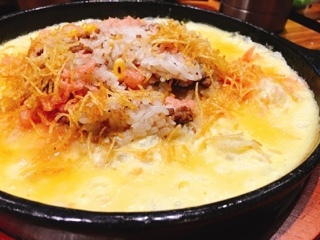 Served in a hot cast-iron plate, the fried rice is surrounded by a thin steamed egg. The egg is good by itself or once mixed around into the rice and left for a while, starts to develop a lovely crust on the bottom. 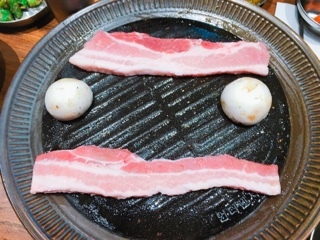 The saltiness from pieces of beef and bacon (?) and the crispy potato slivers on top makes for one interesting and tasty dish. 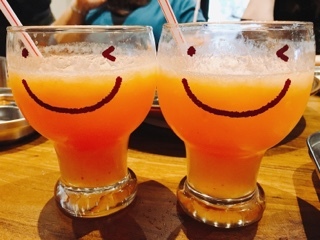 Something I’ve seen all over Instagram is their cheerful cocktails – the sweet fruit punch-like grapefruit soju ($7.95) arriving in a smiling cup that admittedly is infectious. 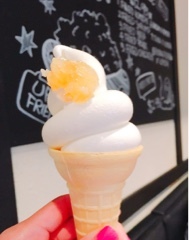 Additionally, another well photographed signature dish is the Oink Oink soft-serve ice cream ($2.95 for the dessert size) – don’t worry, despite the name there’s no pork in the dessert – a vanilla soft-serve topped with honeycomb. Although it makes for a great picture, the actual product isn’t the tastiest given the ice cream’s cold temperature causes the comb’s wax to harden. In the end, after trying the honey, you’re left with a chewy ball of wax to spit out. My advice to the owners is to reformulate the dessert. If you’re going to title something “oink oink” why not actually add something pig related to it? A really thin piece of candied un-smoked bacon could pair better with cold soft-serve. After all, if this Little Piggy’s going to the market, it might as well bring something special.